Because they are continuously consuming food, they continuously defecate, which is one reason house flies are successful vectors of pathogens. 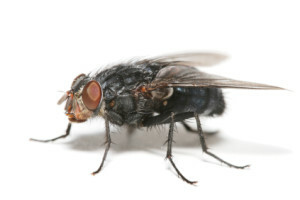 House flies have relatively short lifespans, the adult male living anywhere from one week to one month in the wild. This does not make them any less of a nuisance or potential health risk. Females lay a large number of eggs, approximately 500, in multiple batches. The small white larvae feed on decaying material, which is why we often notice them developing near garbage piles, animal feces or other unsanitary environments. 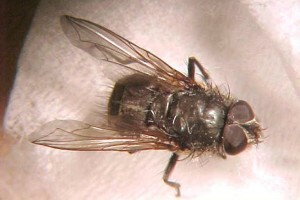 House flies depend on and thrive in warmer weather, so the warmer the temperatures, the faster larvae will develop and the quicker an infestation can develop. 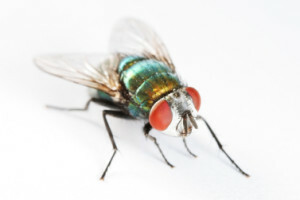 A house fly here or there can be tolerated, but because they can carry disease and they reproduce so rapidly, preventing an infestation is paramount. Strategic Industries uses an array of tested products and materials to safely exterminate large populations of house flies and prevent their subsequent return en masse. Females lay their eggs within close proximity to earthworm habitats because larvae are parasites of worms, feeding off of them while developing into adults, which takes anywhere from 25 to 30 days. People often don’t realize they have a cluster fly problem because the groups remain relatively dormant within the comfort of a warm space. As winter breaks, however, you may notice more movement. Cluster flies, when together, have the ability to give off a sweet, sticky, buckwheat-type scent which can attract more flies during cooler months. To prevent cluster flies, ensure all openings to the property are caulked and sealed well. Sweep or vacuum dead cluster flies immediately. Because some hibernate in difficult to reach areas, such as in between wall, Strategic Industries employs a comprehensive evaluation process, and uses the safest, most effective materials available to curb and control the population once established within your property. Despite its small size, the fruit fly has one the most advanced eye compositions of all insects. The fruit fly's compound eye is comprised of over 760 individual units, also known as ommatidia. Fruit flies are aptly named because the females lay eggs near or on the surface of fermenting fruits and vegetables, or other organic materials, such as compost or leaf trimmings. They reproduce in large numbers, producing up to 500 larvae at one time. One week is a common lifespan for a fruit fly. 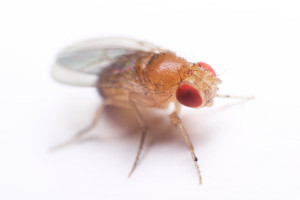 For the most part, fruit flies are simply a nuisance pest; however, if food is left unsecured, they can contaminate it by carrying bacteria and other pathogens into it. The best form of prevention against fruit flies is properly storing and securing food and other organic material, such as kitchen waste and compost. If you see large numbers of fruit flies, call Strategic Industries knowing that we have proven and safe products for eliminating this nuisance, and we’ll also provide you with a prevention plan to keep further infestations at bay. 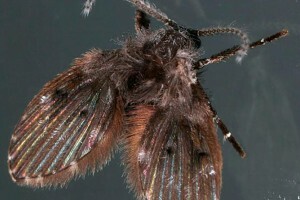 The adult moth fly is sexually mature immediately after emerging from it's pupal stage. Although they have a short life span, approximately two weeks, they are resilient. Many developing larvae can stand up to hot, soapy water being washed down a drain. In warm and moist condition, eggs can hatch in approximately two days, and larvae take another 15 to fully develop. While drain / moth flies present little danger to humans – they don’t bite – they are a nuisance. Keeping the drains inside your property clear of decaying organic matter is your best approach to prevention. If you see these pests in large numbers, contact Strategic Industries. It’s uncommon for them to cluster, so noticing them in bulk may be a sign of an infestation. Adult females lay up to 200 eggs at a time, creating multiple generations every year. Green bottle flies depend on decaying material to develop, so typically, eggs will be laid within a carcass, animal feces or other rotting material. Green bottle flies are larger than traditional house flies, and they boast a longer lifespan. Because they require such specific environments in which to breed, the best prevention method is to eliminate potential breeding grounds. Keeping foods properly stored. Having your property inspected often (even a dead rodent in an attic or between walls can create a breeding ground for green bottle flies) and removing animal waste from around the property are all sound, preventative measures. Strategic Pest is familiar with these infestations and has proven, safe materials and products to remediate the situation.